Improving sales and profit trends sent shares sharply higher last year. 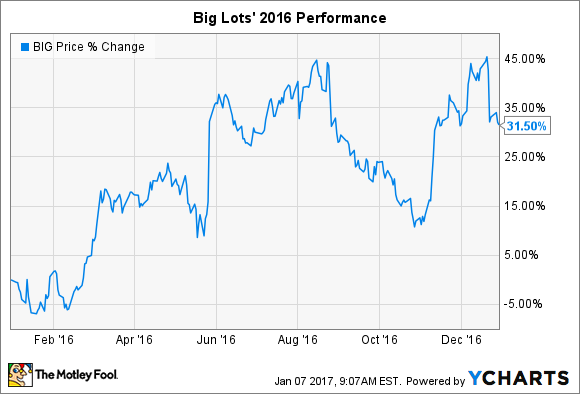 Discount retailer Big Lots (NYSE:BIG) enjoyed a 32% stock price surge in 2016, according to data provided by S&P Global Market Intelligence. The rally pushed shares to new all-time highs, with the stock up nearly 60% over the past three years, compared to a 25% increase for the broader market. The rally coincided with a sharp rebound in profits and mixed results on the top line. Comparable-store sales reached 3% in the first quarter of the year to mark Big Lots' fastest growth pace since late 2011. However, the expansion pace worsened as the retailing industry faced customer traffic challenges. Big Lots' comps fell to 0.3% in the second quarter and were flat in the third quarter. The profit recovery has been much more consistent. The retailer's earnings spiked 31% through the first nine months of the year as net profit margin improved to 2% from 1%. Big Lots executed well around its product offerings and marketing strategies, for example by focusing on what management calls its "winnable" categories of furniture and home décor. The gains allowed gross profit margin to rise to 40% of sales from 39%, putting Big Lots far above full price rivals like Target and Wal-Mart. CEO David Campisi and his executive team believe sales growth will bump along at close to zero for the holiday quarter and will come in at roughly 2% for the full year. If it achieves that result, Big Lots will have managed sales growth for three straight years after two disappointing years of declines. Earnings, meanwhile, are on pace to rise 20% over 2015's result, continuing a two-year rebound. Annual net income. Chart by author. Data source: Big Lots financial filings. Big Lots faces major challenges ahead that go beyond the sluggish growth that its industry is stuck in. Among the most important will be how it handles the threat from e-commerce rivals. Recently, management has poured resources and attention into building up the digital sales channel and last year finally established a presence online. In 2017, that business should start contributing to overall growth, but likely only by the smallest margins to start. Even if the company doesn't log blockbuster results this year, the stock could continue growing. Despite the rally, Big Lots is valued at just 15 times earnings, which isn't expensive compared to discount rivals or to the company's own prior valuation that was as high as 22 times earnings in early 2015.